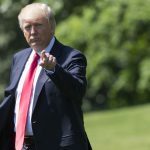 Donald Trump made allegations last week of the Obama Administration spying on the Trump campaign in the heat of the presidential election last year continuing on through December. 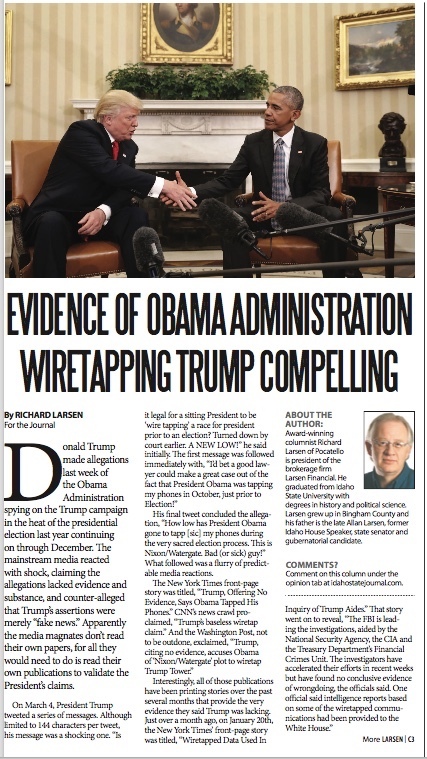 The mainstream media reacted with shock, claiming the allegations lacked evidence and substance, and counter-alleged that Trump’s assertions were merely “fake news.” Apparently the media magnates don’t read their own papers, for all they would need to do is read their own publications to validate the President’s claims. His final tweet concluded the allegation, “How low has President Obama gone to tapp [sic] my phones during the very sacred election process. This is Nixon/Watergate. Bad (or sick) guy!” What followed was a flurry of predictable media reactions. Following Trump’s tweets an Obama spokesman declared, “Neither President Obama nor any White House official ever ordered surveillance on any U.S. citizen. Any suggestion otherwise is simply false.” Please note the wording, claiming they didn’t “order” the wiretapping. Was it perhaps suggested, intimated, or simply allowed? That’s unknown, but clearly Obama’s White House knew what the results of the wiretap were. And that’s according to the NYT. And frankly, if there was no wiretapping, there would have been no data to share with the White House. 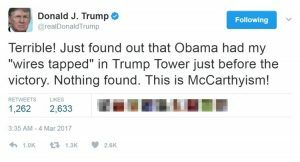 Trump’s first tweet that morning intimated involvement of FISA (Foreign Intelligence Surveillance Act) court involvement in the wiretapping of the Trump Tower in New York. Even that is validated by, not Trump tweets or administration officials, but by the media. 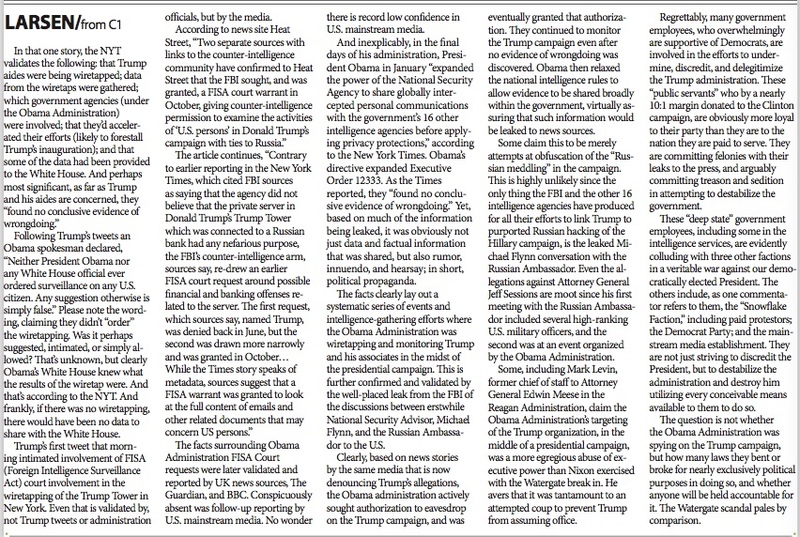 The facts surrounding Obama Administration FISA Court requests were later validated and reported by UK news sources, The Guardian, and BBC. Conspicuously absent was follow-up reporting by U.S. mainstream media. 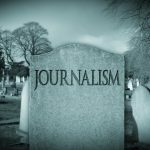 No wonder there is record low confidence in U.S. mainstream media. And inexplicably, in the final days of his administration, President Obama in January “expanded the power of the National Security Agency to share globally intercepted personal communications with the government’s 16 other intelligence agencies before applying privacy protections,” according to the New York Times. Obama’s directive expanded Executive Order 12333. As the Times reported, they “found no conclusive evidence of wrongdoing.” Yet, based on much of the information being leaked, it was obviously not just data and factual information that was shared, but also rumor, innuendo, and hearsay; in short, political propaganda. 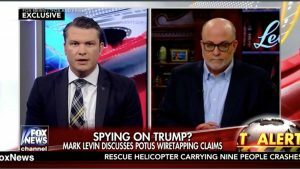 The facts clearly lay out a systematic series of events and intelligence-gathering efforts where the Obama Administration was wiretapping and monitoring Trump and his associates in the midst of the presidential campaign. 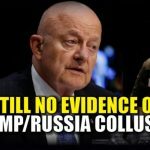 This is further confirmed and validated by the well-placed leak from the FBI of the discussions between erstwhile National Security Advisor, Michael Flynn, and the Russian Ambassador to the U.S.
Clearly, based on news stories by the same media that is now denouncing Trump’s allegations, the Obama administration actively sought authorization to eavesdrop on the Trump campaign, and was eventually granted that authorization. 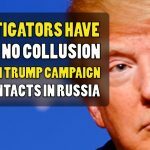 They continued to monitor the Trump campaign even after no evidence of wrongdoing was discovered. 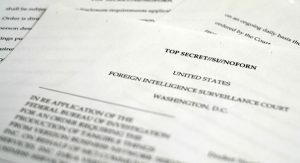 Obama then relaxed the national intelligence rules to allow evidence to be shared broadly within the government, virtually assuring that such information would be leaked to news sources. Some claim this to be merely attempts at obfuscation of the “Russian meddling” in the campaign. This is highly unlikely since the only thing the FBI and the other 16 intelligence agencies have produced for all their efforts to link Trump to purported Russian hacking of the Hillary campaign, is the leaked Michael Flynn conversation with the Russian Ambassador. Even the allegations against Attorney General Jeff Sessions are moot since his first meeting with the Russian Ambassador included several high-ranking U.S. military officers, and the second was at an event organized by the Obama Administration. 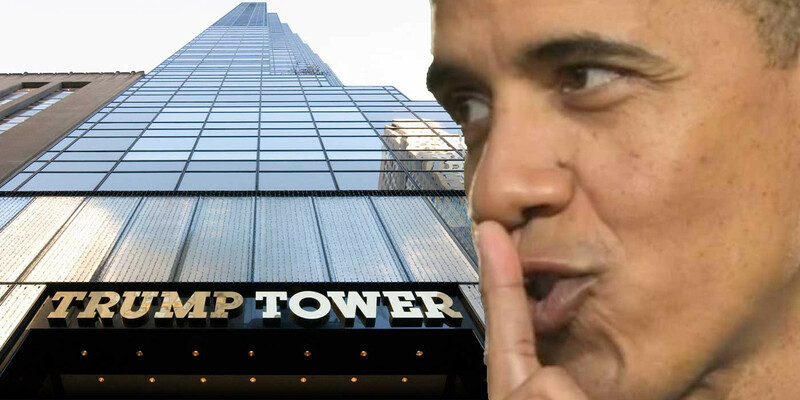 Some, including Mark Levin, former chief of staff to Attorney General Edwin Meese in the Reagan Administration, claim the Obama Administration’s targeting of the Trump organization, in the middle of a presidential campaign, was a more egregious abuse of executive power than Nixon exercised with the Watergate break in. He avers that it was tantamount to an attempted coup to prevent Trump from assuming office. Regrettably, many government employees, who overwhelmingly are supportive of Democrats, are involved in the efforts to undermine, discredit, and delegitimize the Trump administration. 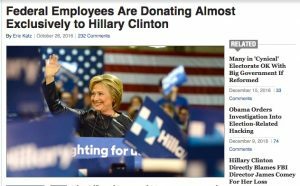 These “public servants” who by a nearly 10:1 margin donated to the Clinton campaign, are obviously more loyal to their party than they are to the nation they are paid to serve. They are committing felonies with their leaks to the press, and arguably committing treason and sedition in attempting to destabilize the government. These “deep state” government employees, including some in the intelligence services, are evidently colluding with three other factions in a veritable war against our democratically elected President. The others include, as one commentator refers to them, the “Snowflake Faction,” including paid protestors; the Democrat Party; and the mainstream media establishment. 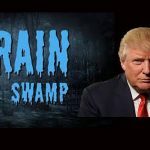 They are not just striving to discredit the President, but to destabilize the administration and destroy him utilizing every conceivable means available to them to do so. 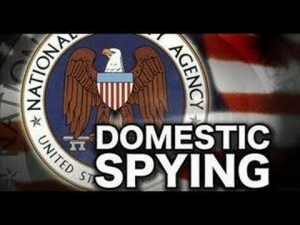 The question is not whether the Obama Administration was spying on the Trump campaign, but how many laws they bent or broke for nearly exclusively political purposes in doing so, and whether anyone will be held accountable for it. The Watergate scandal pales by comparison.